So the last full day of our holiday arrived. Rather than spend another day driving around without clue, we opted to take it leisurely. So we drove once more into Plymouth. Having parked up paying 9 pounds for a full day parking, we made our way into the Barbican district. 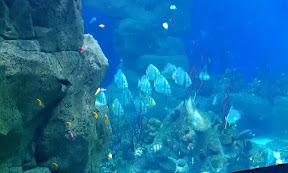 We checked the times for the ferry and then went into the National aquarium centre. It was a stark contrast from the previous day where there was queues around the block this time we walked straight in. we paid our entry fee and made our way to the top of the tour. It has been a long time since I have been to an aquarium in the old days you would be lucky to see a couple of goldfish in a spherical bowl and maybe with a couple of crabs. the Plymouth National aquarium centre is full of fish in fact my stomach was rumbling just at the thought of such delights. The previous nights lemon sole was still fresh in my memory and with every sole I saw I was salivating. Zoe seemed to enjoy herself. 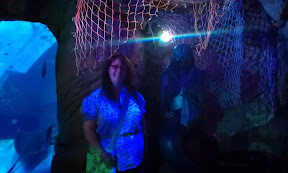 she saw some stingrays and other giant fish and even had her photograph taken with a mermaid. She was like a child in a sweet shop where as I was like a hungry person in a fish restaurant. The tour at an end, we made our way to the ferry departure point. while there we observed the boats coming and going and was surprised at the small ferryboat that arrived to take us to our destination. We were lucky to get on it was so small. I mean 5 inch ferryboats….how are we meant to fit on a 5 inch ferry boat? 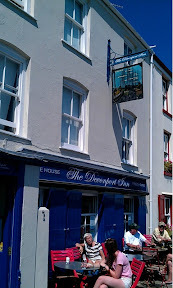 Our destination today was to Cawsands. Again a Cornish misnomer as there was no sands, just sharp pieces of small broken rock. Cawsands is a small fishing village once on the border of Cornwall and Devon. It neighbours the village of Kingsands. Again a tourist trap; narrow streets, cute buildings, full of tourists. Still pleasant enough we stopped at a pub intending to have our cheap lunch however the pub was very expensive. £6.50 for a Cornish pasty no much bigger than one you might get from Greggs or Ginsters. While Zoe had a couple of pale looking Cumberland sausages and some unpleasant looking chips for £9. A bit more walking and it was time to get back on the boat. I can’t comment how pleased I was to get back. Even though the ice cream I had was really nice I still felt kind of light in pocket. 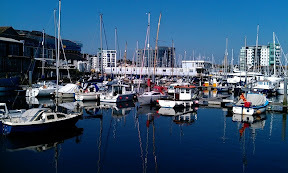 Returning to Plymouth we then nipped into the cider bar on the Barbican. We sat outside on the quay watching the world go by. Before long it was time to head off to dinner. again we had chosen platters as our choice for the evening. I opted for the lemon sole having not thought of anything else since the previous night Zoe went for the mixed grill again. Fully sated we returned to the hotel and took advantage of the spa facilities have an early night in preparation for the long drive home on the Saturday.